What does French orientalist music amount to? Some attractive pieces (the Debussy and Ravel more than that), but there is no descriptive masterpiece among them. Unless it is Jarre’s score. There is no French tone poem of the Sahara. But some of Jarre’s material could have been used in one. Some passages in his score are as imaginatively detailed as passages in La mer. David Derrick responds to my plea for more on Maurice Jarre with a veritable tour de force of advocacy on his Toynbee Convector blog. Yes, David also says some very nice things about An Overgrown Path. But that is not going to stop me saying that his appreciation of Maurice Jarre is one of the best examples of music blogging I have read for a very long time. And what a welcome contrast to the exquisitely crafted variations on themes from the mainstream media that have become the norm elsewhere in music blogs. Religion is like a lake, to which people who are thirsty come from different directions, calling its water by different names. In that spirit I point this path in the direction of the tone poem of the Sahara on the ECM CD seen above. 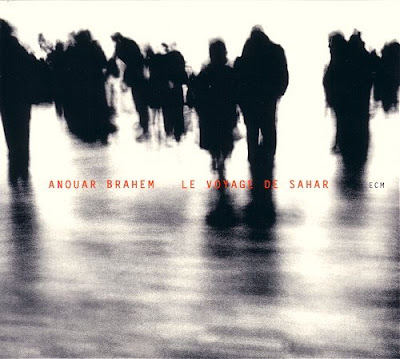 It is not for orchestra, but for the oud of Anouar Brahem accompanied by piano and accordion. Like Maurice Jarre's music, Le Voyage de Sahar transcends boundaries. And like Philip Glass' it shows that world music is the new classical. More music from the Sahara here. Strictly speaking, perhaps not a tone poem of the Sahara, but Charles Koechlin's Les Heures Persane is a work that surely comes very, very close to being just that. I would bet that Jarre knew this work. To Bob, Thank you for the comment. To JW, it's an interesting piece, I agree. I had it in mind when I referred to Koechlin in my post. The CD with it and Schmitt's Salome is worth getting hold of. I'm afraid I can't agree re: Jarre - for me, his film music works wonderfully with images, but heard on its own becomes bland.